The Railway recruitment examination for Group D posts today was cancelled in the midst of the test — affecting six lakh northern region candidates — after question papers were found to have leaked here and 18 persons, including a railway official, have been arrested in this connection. 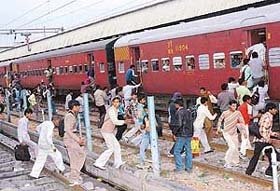 Candidates who were in Chandigarh to appear in a test conducted by the Railways rush to board a train at Chandigarh Railway Station on Sunday. Should detainees in J&K, against whom there are no serious cases, be released? The elevation of Delhi Additional Sessions Judge S.L. Bhayana, who acquitted all nine accused in Jessica Lall murder case, to the Delhi High Court touched off a controversy with a Supreme Court lawyer today demanding that his promotion be put on hold till the High Court adjudicates upon the verdict. As many as 13 persons were killed and 23 others were injured seriously when a bus carrying a marriage party collided head on with a Canter near Bhiwani Road octroi post here today within minutes of departing from the groom’s place. Seven security personnel and a driver were injured in a car bomb blast on the outskirts of Srinagar city today, an official spokesman said. Elsewhere in the valley, the security forces recovered a large cache of arms and ammunition which was to be used in fidayeen attacks. 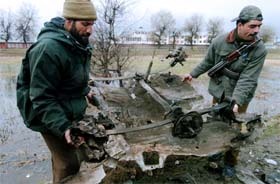 Jammu and Kashmir Police personnel carry the wreckage of a car used in a bomb blast on the outskirts of Srinagar on Sunday. The players I’m looking at have got the talent. What you’re looking for are temperament, competitive instinct, tenacity. I’m interested in what makes champions. Pawan Kumar, the sole breadwinner of a poor family, from Tibber village, near here, was buried under a huge mass of earth at the construction site of a micro-hydel project on the UBDC canal near Babaehali village. Actor Aamir Khan has served a legal notice on a prominent city newspaper, its publisher and two others seeking compensation of Rs 21 crore for using his photograph and quote, without his permission, in an advertisement to promote ‘Filmfare Awards’ held yesterday. The Manmohan Singh Government is keeping a close tab on the issue of Iran’s nuclear energy programme which is bound to come centre-stage in international politics next week. In the wake of a raging controversy over tapping of phones, the Centre has decided to examine and amend the law to check unauthorised interception of telephonic conversation in the changed technological and security scenario. The Kashmir valley was cut off from the rest of the country following the closure of the 300-km-long Srinagar-Jammu national highway due to landslides. A report from Baramula said one person identified as Bashir Ahmad Lone drowned in Hapatnar Nullah at Nadihal in north Kashmir.